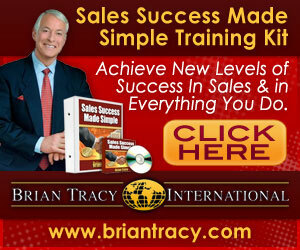 Sales Success Made Simple Training Kit by Brian Tracy - In Sales Now ! 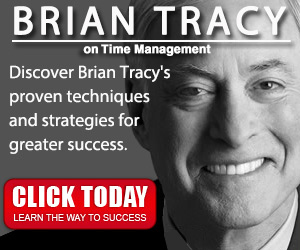 We’re proud to announce our partnership with Brian Tracy International. Now, you can have to your disposition an impressive Sales Kit so you can develop your skills and be the best salesperson in your field. Overcome the fears that stop you to excel and succeed. Learn how to have control over your own life. Develop and implement a plan that takes you precisely where you want to go. Enter every sales presentation with confidence. Learn how to get to the heart of every sale — so sales become faster and easier than ever before. A 72-page workbook so you can follow along and personalize your sales success journey. A FREE sales skills assessment, which identifies all your strengths and weaknesses and details which area you excel in, and which need improvement. 3 months membership in our Business Growth Strategies Online Learning/Training program — a personalized online learning program tailored to your specific personal and professional needs. You get access to a comprehensive, customized learning program, including high-powered video lessons, action exercises and sales strategies — absolutely free. Visit the page, watch the video, review the information and get success! Why people REALLY buy, the one factor that determines 80% of your success, 8 laws of the universe, the 2 great enemies of mankind, why you must overcome them to make a sale, and exactly how to do so. You can also know: 9 places to find good prospects, exact process for making a great first impression, 3 different phrases to imprint in your prospect’s mind to get him to make a buying decision sooner rather than later. It’s important to also master the new selling model, 4 main risk factors in each sale, 4 skills of listening, 7 steps to relationship building, 8 types of objections and how to handle each. I just want to say I am beginner to blngigog and site-building and seriously savored this web page. Very likely I’m planning to bookmark your blog post . You surely have exceptional posts. Thanks a bunch for sharing your web page. Thanks for your comment Jhamary, I appreciate this. This is a tremendous program, how big! lots of stuff… I recently bought it for Black Friday offers and I’m starting the training. It’s a great step-by-step guide. I hope next year would be wonderful with this new kit. Hello Trinidad. It’s great you find this useful. Know this, with the Sales Success Made Simple Training Kit, your 2016 will be awesome. This will change your life as it changed mine. Congratulations on your decision.